Permutation 03.3: Re-Production at P! Re-Production, a group show of work by Arthur Ou, Marc Handelman, and Peter Rostovsky, is the third in a series of exhibitions mounted at P! (“p” exclamation) that have looked to update the conversation on art and simulation. Ou’s black and white photographs, Double Light Leak 1 and Double Light Leak 2 (both 2010), take mechanical applications of paint – from a spray can and airbrush – as analogons of photography’s own shadow castings. Marc Handelman, easily one of the best and smartest painters working today, offers Extrusion/Drift (2013), a large work that could easily be mistaken for a slab of marble, were it not for a reveal at the work’s left edge, which shows both the unpainted primed canvas and the layer of retroreflective screen glass that gives the work its opalescence. The connotations of luxury and illusion here are rich indeed, and this is where Peter Rostovsky comes in. He wants to toss a brick through the art market’s cathedral windows – that is, through the semi-transparent glazing of market orthodoxy that casts all art in the light of originals and copies, fetishises the unique, and throws vast sums of money at securing scarcity as an elite privilege. Rostovsky’s work to this point has taken the craft of painting as a given, while the images it presents, and the culture that encodes them, have been his subject of inquiry. In the wake of the Occupy movements, however, Rostovsky seems to have arrived at a conclusion that those images can no longer be separated from what paintings actually are: products, with a limited audience – not the 99%. So no more ‘original’ paintings. Instead, Rostovsky has taken to ‘painting’ in Photoshop with the use of a Wacom tablet. 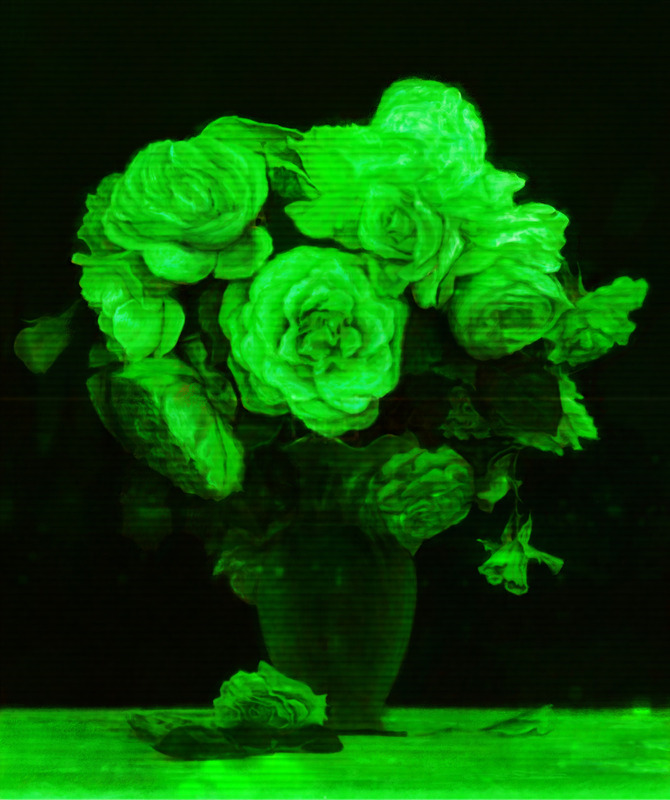 Witness Night Blossoms (2012), a vase of flowers as seen through night-vision goggles (or a Matrix filter on Instagram, if there is such a thing). The image file is free to download. In the gallery, the works – there are two identical iterations – appear as Duratrans transparencies in custom-made LED lightboxes, and the edition of these, just like a download, is unlimited. The philosophy behind the approach, essentially mass distribution minus kitsch, is presented in a dialogue that Rostovsky wrote to accompany the exhibition. In it there is much debate about the value of art versus the value of our experience of it, but the key moment comes when Rostovsky’s avatar asks, ‘Did your record sleeves not function like art? Weren’t they holy shrines that you studied and revered and that connected you to a community? They weren’t limited edition.’ As a demonstration, Rostovsky includes New Order’s 1983 LP Power, Corruption & Lies, whose sleeve art, designed by Peter Saville, reproduces Henri Fantin-Latour’s A Basket of Roses. It would be a compelling model were it not for one thing: a dependency upon that cascade of neurotransmission we call adolescence. We’re all fetishists at fifteen. Continuing to be so throughout our lives breeds the kind of covetousness that begat 2008, and Occupy, in the first place. This article originally appeared in the Summer 2013 issue of ArtReview.